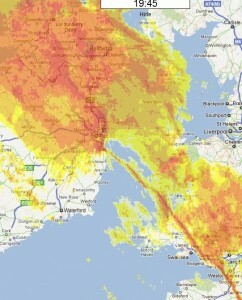 Yesterday Dublin City and its surrounds were subjected to seriously heavy rainfall. 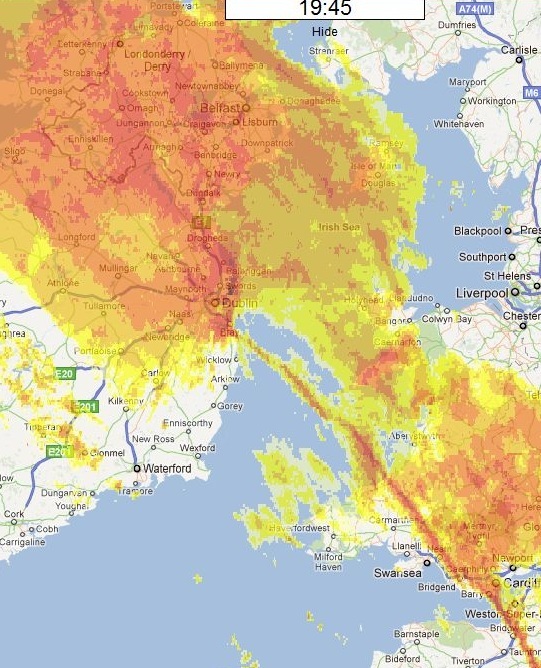 A squall line dumped one month’s rain in the space of three and a half hours; 120mm of rain. This resulted in serious flooding which unfortunately caused the deaths of two people. One was an extremely brave off-duty police man who was sweep away when generously trying to warn traffic about flooded river bridge. The other was a young woman who was trapped in a flooded basement. A large suburban shopping centre at Dundrum was flooded as the result of a blocked culvert, and traffic chaos resulted with many roads becoming impassable. A friend said it took four hours to drive a journey that usually takes 30 minutes. The main flooding was caused by blocked culvers, drains and small rivers overflowing. The main river in the area the Liffey did not flood to a significant degree because it has one large reservoir (and two small ones), which helped to contain most of the deluge. The largest, the Pollaphuca reservoir, c. 20 sq. Km surface area, was formed in the 1940’s by the construction of a reinforced concrete dam. This dam was built in a narrow gorge and is 31 metres high and 79 metres wide at its crest, 18,000 cubic metres of concrete were used to construct the dam. The primary reason for the reservoir was to store and provide drinking water for Dublin, but another reason was to generate electricity. However, if the turbines operated on full capacity they would flood the river downstream. As a result a second smaller reservoir (Golden Falls) was formed using another wider but lower concrete dam 3km downstream. 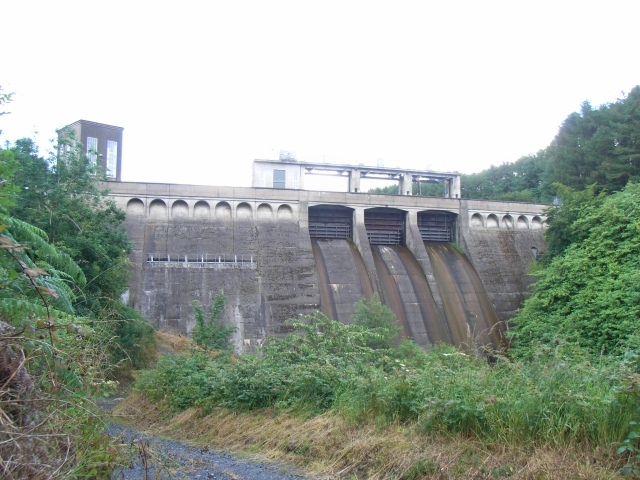 The water was released at a slow rate from this lower reservoir, driving other turbines to produce additional electricity. The Liffey is a relatively small and short river, being only 80 miles in length. Its source is in the Wicklow Mountains, where its upper stages are feed from a large area of bog land. As a result of this, if the upper land was saturated, there was little ability to absorb rain, any additional rain which fell would run straight off and into the river. As a result throughout history the Liffey has been known to be a slow sedate river which occasionally had furious flash floods which caused a lot of damage. However all this changed with the construction of Pollaphuca reservoir, which I understand can accommodate a 200mm of rainfall event, over 48 hours, in its catchment area. This is assuming that the reservoir is already at its highest allowable level. However prior to yesterdays floods the reservoir was at a lower than normal level, so there was plenty of capacity to absorb and store yesterdays heavy rainfall and prevent serious flooding of the river Liffey. So here’s to the 80 year old unsung hero, the dam at Pollaphuca.